I have just started a new painting. I call this one Methane Swamp. Last year at Thanksgiving, Rob and I were on our own, so we decided to go camping. We have a truck and camper. It is a new, quite comfortable three-season camper. It has a slide, so it is roomy, and the kitchen is far more functional than in most campers. Canadian Thanksgiving is in early October, so although the evenings are chilly, the weather is still fine for camping. We went to the mountains, and camped at a lovely place called Mill Creek. Although it is clearly a favourite place for random campers during the summer, judging by the large number of fire pits, areas of trampled grass, and abandoned beer cans, in October we had the place all to ourselves. We arrived Saturday evening when it was already getting dark. We spent the next day hiking along the creek. That evening, I cooked Thanksgiving dinner in the camper. We had Cornish game hens stuffed with rice and cranberries, veggies, salad, dinner rolls, and wine. It tasted wonderful! It was the first time I had ever used the camper's oven, and it worked just fine. I didn't attempt pumpkin pie, however. Maybe next time. On Monday morning, we hiked around the area a bit more. We discovered that we were near a series of interconnected swamps. A trail cut along the hillside above the swamps. I scrambled down the steep hillside to get down to the pools and stream. The area was visually interesting. Dead white trees poked up out of the water at various angles. The water was shadowy blue and black. There were hummocks of yellow grass, and red oxide mud along the shoreline. We observed that methane gas was bubbling up from the mud on the pond bottom. The place had a mysterious, almost ominous feeling to it. I took many photos, knowing that I wanted to paint the scene, but not having time that morning to paint on location. It is a year later, and I have finally gotten around to uploading the photos off my camera onto the computer. I looked at my methane swamp photos and was disappointed. They were dark, and too busy. They did not represent well what intrigued my eyes when we were there. I finally decided on one particular picture to use as a reference photo and printed it out. After considering it further, I chose to focus on the top right hand corner of the photo. I took a ruler and (cleverly) marked out a rectangle the same dimensions as my canvas. This solved a problem that I often have when using a reference photo: the photo is seldom exactly the same dimensions as my canvas, and that makes it hard to get the drawing right. I am working on a smaller canvas than usual - 14 x 18 inches. I just finished a larger painting with quite a bit of detail, and it took me a long time to complete it. So this time I wanted to work fast and loose, and finish quickly. I drew the main shapes in, placing them carefully, but not putting in any detail. Then I painted in the white dead trees and their reflections, just roughly, and the yellow grasses along he shore. That was as far as I got the first evening. 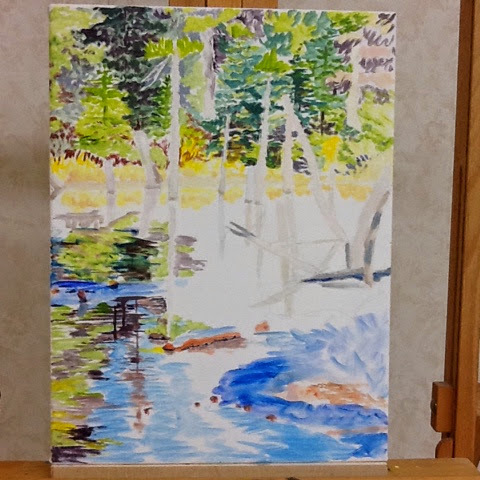 Tonight it took me about two hours to block in the trees, and some of the reflections in the water. As always, I am struggling to get the dark values dark enough. Also, this picture has lots of green in it. Green is my nemesis. I usually try to avoid using a lot of green as I find it hard to represent green the way I see it. But, in landscape art, it is not that easy to stay away from green! The image is quite complex. So far, I am having fun with it. I was speaking with my son recently about this question. He is just about to finish his schooling, racing through the readings and assignments of his final year. University has been his life for nearly four years, and now he is on the threshold of something else. But he doesn't know what that something else is. He is mentally trying out the possibilities of different career paths. It is hard to visualize the unknown. When I was a child, I always felt stumped when adults asked me the question, "What do you want to be when you grow up?" (I think maybe the adults of my childhood were not very good at conversing with children, because they seemed to always ask this, or, "What grade are you in?" Or, if they were men, jokingly, "Who's your boyfriend?"). My typical answer to the what to be question was, "Anything except a secretary, nurse, or teacher." Those were the three career paths considered suitable for a girl back in those days, so, of course, I was quite certain that I would not pursue any of them. I never told anyone about wanting to be a queen. I knew people certainly would make fun of that. Of course, I knew I could never be a real queen. I was growing up in the sticks of northern Canada. My family was not royalty. And even as a small child, I knew that I would not enjoy all the publicity and public obligations expected of the Queen. Looking back, I think what being a queen meant to me was leadership. At that time, aside from the Queen of England (and Canada), and my school principal who was a woman, there were few examples for me to see of women in leadership positions. Even if I had had the words for it, I still don't think I would have told anyone that I hoped to pursue a leadership role in whatever career I chose. Leadership -- being the boss, the chair, the vice-president -- wasn't seen as an appropriate aspiration for a girl. And it still isn't, for the most part, although few people will come right out and say it. Little girls who try to lead are taunted as being "too bossy." Lots of research out there shows that most women still hit a glass ceiling in their career trajectory. When successful women are interviewed, the majority of them say that they kind of stumbled into leadership; it hadn't really been their plan. The research also shows that female leaders, more than their male counterparts, secretly suffer from the self-perception that they are imposters in their role. So, now as I approach senior citizenhood, I can report that I did become an artist, a writer, and a queen. it was a strange zig-zagging path, and I did a variety of kinds of work along the way. My art, unfortunately, has been done alongside a busy career, which means that I do not have very much time for it. Writing is something that I have done both as an integral part of my career, and alongside my paid work. And I have been in managerial and leadership roles in my career for more than a decade. So, the point of this story is: Listen to the little kid in your head, that child you once were. He or she might know more than you would have expected. Also, I think this story is about having the courage to dream. It's your life to make of it what you will.